We live in a world which is full of busy schedules, delayed meetings, tensed boardroom discussions and unending hours at work. In the midst of all this, we forget to take care of ourselves. Our body requires the right kind of food to get us going and to perform well. To break the everyday monotony of work, we need food that is wholesome yet extraordinary to satisfy our taste buds. In the middle of a hectic day at office when Satwick Tandon and Sandeep Shetty used to take a lunch break, all they saw was the disappointment that everyone faced with their lunch options. Being avid food lovers who enjoy different cuisines, they realized that the problem of limited food options needed to be solved. Be it the cafeteria food, tiffin or restaurant take outs nothing provided the taste, variety or wholesomeness that they were looking for. The foodie within them realized that the one thing that gave everyone joy – ‘Food’, is the thing that was also making their dining experience disappointing. It was this moment that motivated them to start ‘Chomp Food’. “Our understanding of consumer behavior, food and process industries, marketing and general operating experience and not to forget our love for food assured us that we had the right skill sets and passion to solve this complex problem,” says Satwick Tandon, co-founder – Chomp Food. Chomp works closely with the best food joints to bring you hand-picked wholesome meals-for-one options that you will enjoy while struggling at work. You can choose from their daily-changing menu and have it delivered straight to your doorstep. You can even pre-order for delivery in a time slot that works for you. The team at Chomp does a lot of primary research and applies proprietary analytical models, to select partners as well as to curate the menu that appeals to the ever changing tastes of the customers. Being a customer centric brand, Chomp engages with customers regularly. “We request customers to give us feedback each time they experience Chomp.” Satwick adds. They believe that having personal conversations with customers is vital to understanding their needs and evolving tastes. Chomp has been built with customer preferences being the foundation and every aspect of the business is managed with this mindset. What keeps Team Chomp going is the excitement of solving a big and complex problem, the creativity & innovation required to excel, the constant growth that they see every single day and the love for food that drives them to strive harder. It is the reaffirmation of the faith that customers put in Chomp that pushes them to go that extra mile. Beginning with the aim of bringing joy to customers through great food, be it at work or at home, Chomp aims to be the food provider of choice to its customers across major cities globally over the next 5 years. 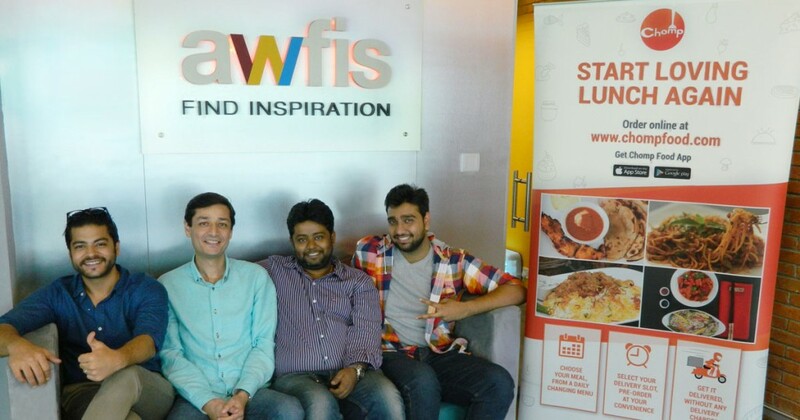 Their go-getter attitude to excel and the perseverance to convert their love for food into something big is what inspires us at Awfis. We are proud to have such inspiring stories building in our centres! This story is based on the interview of Mr. Satwick Tandon, Co-Founder – Chomp Food by Awfis Editorial Team. The solution is right here! Hire a shared office space in Andheri East, Mumbai or co-working space in South Extention, New Delhi, the commercial hub of Mumbai and target your audiences, which are within the proximity.